JBoss World is on for February the 13th 2008 at Orlando. I'll be doing a Drools talk there and I'll also be on Bob McWhirter's OSS round table, where we will talk about successful strategies for OSS communities. As some of you, our users, already know, we are working on a series of features for CEP and ESP support for the next major release of Drools. We weren't talking much about it (busy researching and writing code), but I think it is time to share with you a little bit of what we developed on the Stream support side. The first thing to understand is the concept of an "Entry Point". When we work with streams, where the volume of data is usually huge, it is mandatory that we develop a way of scoping where that data will evaluated. Another mandatory requirement is the ability to effectively work with multiple streams in parallel, and for that, we need to effectively parallelize parts of the network, so that we don't create bottlenecks among different streams. So an "Entry Point" is a channel through which you can assert data into the engine. All facts asserted through one entry point are only visible by patterns associated with that entry point and all entry points are independent of each other, thread safe and can run in parallel. So, in the above example, you have one single rule correlating events from the working memory (Customer) and from 2 different streams (HomeBrokerStream and StockExchangeStream) at the same time it keeps each of the streams processing in parallel. The good thing about the implementation we did is that we leverage the characteristics of RETE to support the streams, like node sharing, indexing etc. So, if you have multiple rules with patterns that are associated with the same streams, the patterns will share nodes, index facts, etc transparently. Another interesting characteristics is that we handle heterogeneous streams. I.e., each stream is not limited to a single type of event/fact and this is all transparent to the user. The engine select the events/facts from the stream based on the patterns the rules are looking for. There is still a lot to do, but we are getting there. Yesterday I told a friend what I do for a living, and she's still in shock. I don't think the words 'grabbing people's brains and shoving them into a PC' was the most tactful explanation. I wouldn't recommend explaining Rules and RuleFlow to your boss in those terms either. Unless they already think you're some sort of Frankenstein and you have best friend called Igor. The Health services in Bangladesh (like many elsewhere) can't get enough doctors. Training more is not a solution ; those that do qualify tend to leave for higher rates of pay elsewhere. So, given the desparate need for trained medical staff in rural areas(to curb child mortality rates), what are health workers to do? The solution that the Health workers came up with was IMCI - or Integrated Management of Childhood Illness. It takes what the Knowledge in Doctor's head's and writes it down as a simple guide that health workers can follow. When a sick child is brought into the remote clinic the health worker is able to follow the simple step-by-step instructions to make quite a sophisticated diagnosis. I've no medical training beyond simple CPR (and if you're relying on that then you're in real trouble) but even I can understand it. Look at the pale blue box. It's a set of medical rules: Are there any danger signs? What are the main symptoms? What combination of these symptoms are there? What is the age of the child? How long have they been ill? Depending on the outcome of the rules, go to the next set (the pink / yellow /green) boxes and apply the rules that you find there. Rules are 'when something is present , then do this'. And not just single rules, but many of them. Together, loads of simple rules allow you to come up with quite a sophisticated diagnosis. 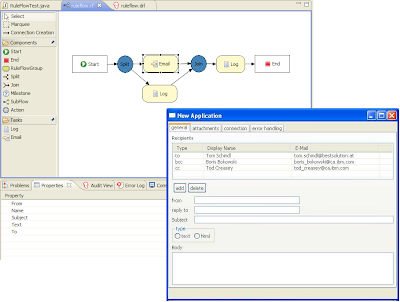 Ruleflow allows you to group your rules. If you're a health worker with a sick child you want to do the most important checks first. Depending on the outcome, you then apply the next set of medical rules: Pink if they need urgent referral to the hospital, yellow if the clinic can cope , or green if the child can be looked after at home. As gory as it sounds, everybody, including the doctors, are happy that their 'brains have been put into a PC' (or in this case , a set of paper cards). The Doctors are happy because they can (guilt free) move to better paying jobs. The medical workers using the system are happy because they can help the sick children that they see every day. And the children gain because the better availability of medical knowledge (via Rules and RuleFlow) is literally the difference between life and death. Paul Browne also writes on the People and Technology blog. Quite some time ago, I created the fit-for-rules project, which was built using the FIT framework (Framework for Integrated Tests). I was quite a fan of fit - however for reasons unknown it has not yet taken off in the mainstream (perhaps its just too strange, I think its brilliant, but then I like egg nogg lattes at Christmas - no idea why, its not something I would normally like at all). Recently we have been working on an integrated testing tool to encourage people to write tests for rules the TDD people do for code. This tool, still doesn't have a name, so feel free to suggest some names. In terms of the tool itself, I spent some time looking into BDD (behavioral driven development - not the disease), and tried to adopt the BDD nomclamenture. So, the basic test item is a Scenario. A scenario is essentially a sequence of data followed by expectations (ie in a given scenario, expect things). Expectations can be data, or rules firing etc. Given some data -> Then fire the rules -> Expect some results -> Modify some data -> Fire the rules -> Expect some results. You can see it looks not unlike the guided editor. You set up facts, and then simulate rules firing (actually they do fire, unless you tell it to not fire certain rules). You can then check the data and rules after the fact (rinse, repeat). These tests are just as important as the rules, and will be stored as such. Simulating a date is optional, but handy as often rules are dependent on time. Suggestions for a name for this? Recently I got the Drools dialect system working for processes, as discussed in this previous blog article. The dialect system is a pluggable framework to allow code to be written with different languages. Previously Split constraints would only work with rules, so the next stage was naturally to allow for constraints to work with code, like traditional process engines - ofcourse the code constraint would also work with the dialect system. 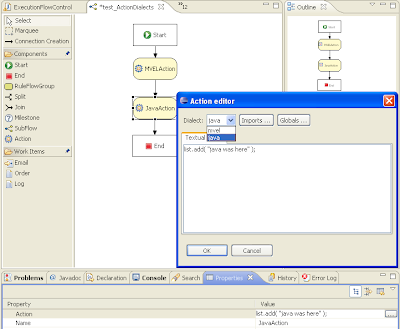 Below is a screenshot of a Split node with both MVEL and Java code constraints and MVEL and Java rule constraints. James Childers (of the macjavadev blog) has helpfully come up with a (slightly humorous) Real Quickstart guide (I like to call it the "missing manual"). Its good advice. We do have plans to have more 5, 10 minute tutorials. Of course to save some work, we are changing some aspects of the user interface to try and get rid of the annoying confusing bits (especially around package management, and navigation). So with the BRMSv2, expect to see more of these "ease into it" style tutorials (I was quite fond of the olde codehaus 1, 2 and 5 minute tutorials, it was what got me into drools in the first place). In the mean time, sit back, relax, or something, and take a look at the following. The documentation on Drools is a little bit light on the "where the hell do I start" part, so here's a quickstart guide. I'll walk you through getting the equivalent of a "Hello, World" app up in Drools, i.e. the simplest setup possible. This will use the Drools web management interface, and will not require any actual code whatsoever. This assumes that you, much like myself, in fact know next to nothing about Drools, and just want to play with it before getting into Rete algorithms and truth maintenance and all that crap. There are only three requirements. You have your own servlet container: Tomcat, Glassfish, whatever. You have in your possession a JavaBean in some .jar flie somewhere. Any bean will do. You don't require screenshots. Sorry, I'm lazy. Maybe in the future. Download the Drools BRMS from JBoss. Deploy it to your app server. I like Glassfish. Log in to it. (Mine deployed to http://localhost:8080/drools-jbrms/). User ID is "", password is "", without the quotes. You should see five options on the left: Info, Rules, Packages, Deployment, and Admin. Click on Admin. Click on "Create New Category". Name your category something clever. We'll call ours "BannerAds". Save it. Click on "Packages". There is a button on this page that will allow you to create a new package. It is small and has no label, but does have a tooltip. Click on it. Give your package a name and optional description. We'll call ours "MyPackage". Save it. 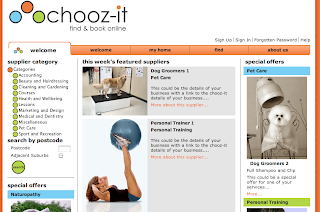 There is another tiny, hard-to-find button on this page that allows you to create a new model. Click on it. This model will reference the jar file that has your bean it in I mentioned earlier. Name it something witty like "MyBean" and save it. You should be at a screen that will let you upload your jar. Do it. Holy crap we're almost there! Now click on the "MyPackage" package in the tree, then "Edit Package Configuration" in the main window. No semicolon at the end. If you want to get crazy and are lucky enough to own more than one JavaBean, do more than one import. Wow we should actually be able to make a rule now! AWESOME! Click on the massive 16px button that will let you "Create New Rule"
Give it a name and category and type it as "Business rule". Save. Ok, now comes the real test. Click on the big green plus sign to the right of "WHEN". You should see a window that says "Add a condition to the rule..." If everything was set up correctly -- and that's a big if -- then you should see two selects: "Fact", and "Condition Type". If all it says is "Add a condition to the rule..." and nothing else, then you screwed up. Also these instructions may be wrong. It is much more likely that you screwed up because I have a blog. If it doesn't work please go to step RTFM, else continue. Fact. Click on it. Select your bean. Figure out the rest on your own. You're now to the point where you can create rules based upon your bean. Doing so using the visual editor is pretty self-explanatory. Last week we saw our highest web hits with 726 unique views, which is on top of the subscribers and the views at syndication sites like JBoss. Take a look at the schedule here. Take a look the contents of the BOF here. Take a look at the updated manual here. The manual now contains some insight about the problem size of the examples. Did you know that the traveling tournament example nl16 finds a feasible solution out of 2,45064610271441678267620602e+259 possible solutions? Many of you would have read my blog on unifying rules and processes, which was also featured at infoq. Unifying these technologies is not just about the modelling paradigm it's also about the infrastructure overlaps. 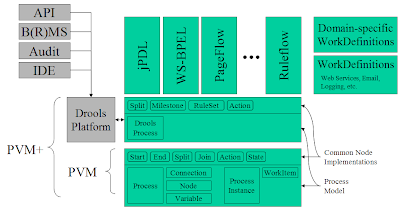 Today I just finished my first end to end test for dialectable actions in a processes definition - which we call ruleflow, indicating its a melding of the power of processes and rules - so what does this mean? Pluggable Dialects has been apart of the Drools framework for a while now, what it means is that any eval conditions and the consequence of the rule and can be written in any language; we currently support Java and MVEL as dialect plugins. Scripting language plugins like MVEL are very easy to integrate although compiled languages like Java add extra levels of complexity - this is because we want to compile all our consequences, and now actions, in a single pass. The compilation is at a later date than when the rule/action itself was built and thus we need an additional wiring process to hook the compiled code back up to the rule/action. As we've already built all this for the rules framework with a bit of tweaking the process framework gets it for free - and thus we start to see the value of a unified core. Notice as well how the rules and process apis are complimentary to each other. The image below is from the unit test for the process definition in the above screenshot. I'm still waiting for the JBoss bouncers to hand me my coat and ask me to leave this blog. Mark gets to talk about Unifying Rules and Processes. Fernando and Michael are very proud of the 2nd version of the Business Rules WebApp . And I get to talk about pigeons. Yep, Pigeons; birds that fly, sometimes useful for carrying messages and have one hidden talent. During the cold war, the Soviets (allegedly) trained pigeons to inspect ball-bearings on the production line . The Pigeons would sit in comfortable little boxes while the shiny silver ball bearings steamed past on a conveyor belt. If the pigeon spotted any that were defective, they would peck a button and the broken bearing was gone. Since the fall of the Berlin wall, all the pigeons have been gainfully re-employed over at Google. Thankfully the pigeons didn't go to work at a Bank in the City (have you ever seen anything with feathers drive a Ferrari?) . While the pigeons would be very good at responding to simple market events events (Market up , sell; Market Down , Buy). more complex analysis escapes them; For example ; if the market is down for the 30 mins, and Shares in Acme corp are down more than 10% than the average ,and I have seen 3 buy orders for that share in the last 60 seconds = I think the market is about to turn = buy shares in Acme corp.
Never mind pigeons; most humans would find that difficult - think about trying to read the stock ticker prices (the ones you see rolling across the screen at MSNBC) for all stocks, while trying to hold the buy and sell information for the last 30 minutes in your head. And do that not only for one , but for the couple of hundred different types of shares in the market. And while keeping an eye on your own trading position so that you're not exposed to one sector of the market (e.g. keeping enough cash , not too many property or technology shares. No wonder most traders make their millions and burn out before they're 30 - that sort of Complex Event Processing (CEP) will wear you out. Most IT applications are like pigeons; they can only handle simple events. Press Button. Do something. The way to make millions is to design applications that can handle these complex events, and apply sophisticated business rules to the (evolving) situation. And do it quickly enough (milliseconds) to seize the opportunity before somebody else does. A keep on doing it as long as the market is open. Funnily enough, Complex Event Processing is part of the vision for Drools. With enough support, I'm sure we could convince Mark to stand up at JavaPolis and use a set of Pigeons on his slides. I suppose it's better than using pictures of lego people to explain how to do projects using Agile. The JBoss Drools boys have something cool brewing. They already have the most useful GWT (Google Web Toolkit) App that I've seen outside of the Googleplex. That's a fully fledged app ready and waiting to be used in anger, not some example widget, or a test case thrown together by somebody playing with the technology. The BRMS app itself, targeted at business / professional users, allows them to catch the knowledge that they have in their heads and share it with the team. Here's the problem; If you're into Rules, you've probably already downloaded the BRMS - ( Business Rules management system). If you're just a casual browser, as cool a GWT app it may be, but you're not going to download. Why? Unless you have Tomcat or JBoss 4 ready and waiting on your PC you're not going to bother (note ; this will work on other application servers like weblogic , with another couple minutes work, but that just proves my point). In order to make things easy for us lazy people, the nice people at Drools are preparing a standalone BRMS; download , unzip , start and play. That's presuming you have Java installed. You do have Java installed don't you? But being lazy, how big a download is too big? I'm not the best person to answer the question - I've already downloaded the (largish - 530mb) Red Hat Developer Studio (now at release candidate 1). So what's your download speed and how big (small) does the BRMS have to be before you'd consider trying it out? Answers on a postcard below. As the above graph shows, ignoring spikes, there has been a steady uptrend in the growth for usage of the Drools user mailing list. One of the things the core developers are proud of is our community support, we try our best to answer all emails and to date have mostly succeeded in this endevour. However it now seems there is a constant stream of emails and regrettably we are no longer able to reply to all of them, the community itself is starting to answer more of its own questions which is helping a little, but many questions are now going unanswered. I know that myself I tend to work in bursts, scanning the unanswered messages and replying where possible. Obviously the less vague and easier to answer questions tend to get replies. So now more than ever if people need a response they need to be more diligent in how they phrase their questions and the supporting information they supply. Just got back from the Irish Java Technology Conference, for this presentation I had another go at trying to explain how a production rule engine works - the behaviour, not the algorithm. As I've mentioned in the past I'm finding it easier to talk about SQL to begin with, to frame people's minds. If you jump into an example, straight away they are thinking, or asking, "how is this different from an 'if' statement in java". By taking the SQL approach you hopefully break that problem. The presentation takes 3 tables with data and shows the resulting rows for 2 different views, and how data might change if we had triggers on those views. So it gets people thinking in terms of cross products and rows of data (tuples). I then show the same data against rules and the resulting rows, which is identical to the views. Showing that basically a rule is a view on data, resulting in rows (tuples) of matched facts. The consequence is executed for each resulting row. This concept is taken further to say that if each rule is a view then the agenda is just an aggregate view of all the rule views. As you insert, retract and update data, rows are added and removed from the "agenda view". I then introduce the idea of conflict resolution and salience, along with two phase execution, as a way to determine which of the rows in the agenda view have their consequences fired first; a new simple rule with a salience is added, along with the resulting agenda view tables show the impact of this. The presentation then goes on to touch first order logic, specifically 'not' and 'accumulate' and details our ruleflow work, the normal screen shots are supplied for explaining the rest of the capabilities of the system. I also did a populated BRMs demo at the end. Do give me feedback on my approach to helping people understand, via the sql and views analogy, production rule systems - I'd certainly like to try and improve the slides to help explain this better. The presentation takes 3 tables with data and shows the resulting rows for 2 different views, and how data might change if we had triggers on those views. So it gets people thinking in terms of cross products and rows of data (tuples). I then show the same data against rules and the resulting rows, which is identical to the views. Showing that basically a rule is a view on data, resulting in rows (tuples) of matched facts. The consequence is executed for each resulting row. This concept is taken further to say that if each rule is a view then the agenda is just an aggregate view of all the rule views. As you insert, retract and update data, rows are added and removed from the "agenda view". 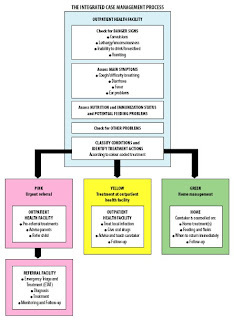 I then introduce the idea of conflict resolution and salience, along with two phase execution, as a way to determine which of the rows in the agenda view have their consequences fired first; a new simple rule with a salience is added, along with the resulting agenda view tables show the impact of this. The presentation then goes on to touch first order logic, specifically 'not' and 'accumulate' and details our ruleflow work, the normal screen shots are supplied for explaining the rest of the capabilities of the system. I also did a populated BRMs demo at the end. Do give me feedback on my approach to helping people understand production rule systems, via the sql and views analogy, I'd certainly like to try and improve the slides to help explain this better. I'm at the Irish Java Technology Conference doing a talk on Drools. My talk is this Friday the 9th of November from 11:00 to 12:15, where I'll be demoing our BRMS. Steve Shabino has started a blog on his experience with Drools, as they have an extreme problem to solve involving the need to reason over 2mill objects in a stateful session. I'm really looking forward to seeing his findings. The mysterious Yaakov Kohen has started blogging again with an insightful blog on the problems with todays acadmic benchmarks. Admins/operator types (migrate, security setup etc). Nothing that complex, but we do need to have it scale up and down to these skill levels. I think we can do something like merging the previous BRMS organization with the new tree feature. We do like the tree/explorer motif, fairly familiar to most people and easy to make it filterable based on both server side and user settings. Also, its more like ideas that the jboss web console is moving to. Also with this refactory we will enable I18n internationalization then people can easily edit the bundle file/config to add they own language setting. Other key features like rule based authorization and custom queries are also some of the new features. During my time at the Business Rules Forum and RuleML I met a big company, one of America's largest medical insurance companies, and they are very interested in funding a SBVR authoring environment for Drools, possible utilising the existing (but inactive) SBeaVer project. For those that don't know SBVR is a standard for representing rules using a structured natural language approach. We are currently looking to create a group of stake holders, managed by the existing SBVR group, who would be interested in funding this work to make a usable reference implementation authoring environment for the SBVR spec. If you are interested and able to help, or know someone that might be interested and able to help, then please email me mproctor a@t redhat d0t com. The idea is to finding initial phased funding for the work and to provide an ongoing maintenance fund. The SBVR group are currently evaluating a number of 3rd parties to undertake this development effort, once funding has been resolved. As Mark mentioned in a previous blog, we are attending the 10th Business Rules Forum in Orlando. Tuesday (October 23rd) was the first presentations day and I had the opportunity to watch a few interesting presentations. In the morning I watched the keynote with Ronald Ross: "The Hitchhicker's guide: from Business Rules to Enterprise Decisioning"
The real deal, in his words is to understand that Business Rules are the means to an end, and as such we need to stop focusing and justifying the means and start focusing and justifying the ends, i.e., the implementation and deployment of complete Enterprise Decisioning solutions. Another point I thought was also interesting was his statement, that I completely agree, that the decisions we need to automate are not the big strategic and broad company decisions, but the small, frequent, everyday, thousands of operational decisions, as these are the ones that will give us the greatest returns and allow us to quickly answer to trend changes. Another great presentation I attended and worth mentioning was "Business Rules, Decision Management and Smarter Systems" by Neil Raden and James Taylor, authors of the recently released "Smart (enough) Systems". They are very good presenters and talked a lot about what are "Smart (enough) Systems", the challenges and opportunities, but again, the highlight point for me was the realization that today, at least 80% of the decisions made everyday in a business environment are what they call "hidden decisions". I.e., the small decisions manually taken by people involved in the business that are not documented and automated that inevitably lead to inconsistencies and unpredictability on the business results. The idea is that expert decisions will continue to be made by experts for a long time still, some big/broad decisions will continue to be made by people in charge, but to ensure consistency, predictability, trusted statistics and allow business optimization, these hidden decisions need to be uncovered and automated. The other presentation I would like to mention and that was in my opinion the best presentation so far in the event was Stephen Hendrick's (IDC Group VP) keynote: "Intelligent Process Automation: The Key to Business Process Optimization". Stephen presented us with the big picture for the coming years. Where to go, from a business process optimization perspective, what are the challenges and the gains of implementing IPA, a few success cases of companies that already have IPA solutions in place and an illustration case of what may happen to those that don't. He also emphasized that solutions for all the key constructs above already exist, but we still fail in delivering completely integrated solutions that minimize risks and maximize gains of customers implementing them. At least, we know that us in Drools development are heading to the right direction. 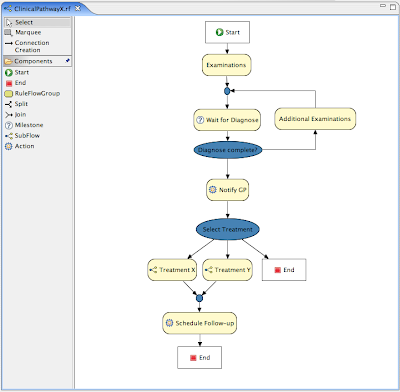 As you probably know, we are tackling the Event Processing and the BPM integration side in our solution and improving our rules engine product to become more than a rules engine: a real Enterprise Decisioning tool in a complete Behavioral Modeling platform. We just released Drools v4.0.3. This is a minor release with a few improvements on existing features and some bug fixes. We just released Drools v4.0.2. This is a minor release with a few improvements on existing features and several bug fixes. We also included a lot of new documentation, specially in the examples section. Important: there is one backward compatibility break when using Rule Flow. If you use Rule Flow, please check the section 1.2.5 of the manual for details. This is now the stable version of Drools and from now on, we expect to only release eventual bug fixes in this branch. We are starting now the development of the new major release of Drools and new features shall all be added to it. For those curious about what is coming, please check previous posts on this blog. Mark's slides presented at Synasc also talk about several things we want to do for the coming versions. [ JBRULES-1210 ] Implement support to multi-pattern accumulate to the XML parser. [ JBRULES-1141 ] context assist no longer works for functions in the drl. 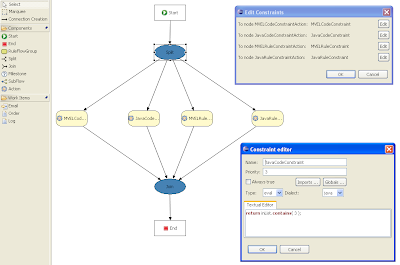 [ JBRULES-1169 ] PredicateConstraint and/or MVEL Constraint issue? [ JBRULES-1212 ] Rete throws NoClassDefFoundError when asserting facts with classess loaded by inaccessible classloader.